Each State Party shall designate a central authority that shall perform the functions assigned to it in the Inter-American Convention on the Taking of Evidence Abroad (hereinafter referred to as "the Convention") and in this Protocol. At the time of deposit of its instrument of ratification of or accession to this Protocol, each State Party shall communicate its designation to the General Secretariat of the Organization of American States, which shall distribute to the States Parties to the Convention a list containing the designations received. The Central Authority designated by a State Party in accordance with Article 11 of the Convention may be changed at any time. The State Party shall inform the above-mentioned Secretariat of such change as promptly as possible. A State Party that is also a Party to the Additional Protocol to the Inter-American Convention on Letters Rogatory shall designate the same Central Authority for the purposes indicated in the two Protocols. Letters rogatory requesting the taking of evidence shall be prepared on a form conforming to Form A of the Annex to this Protocol, and shall be accompanied by the documentation to which Article 4 of the Convention refers and a form conforming to Form B of the Annex to this Protocol. If a State Party has more than one official language, it shall, at the time of signature or ratification of this Protocol, or of accession to it, declare which language or languages shall be considered official for the purpose of the Convention and of this Protocol. If a State Party comprises territorial units that have different languages, it shall, at the time of signature or ratification of this Protocol, or of accession to it, declare which language or languages in each territorial unit shall be considered official for the purpose of the Convention and of this Protocol. The General Secretariat of the Organization of American States shall distribute to the States Parties to this Protocol the information contained in such declarations. 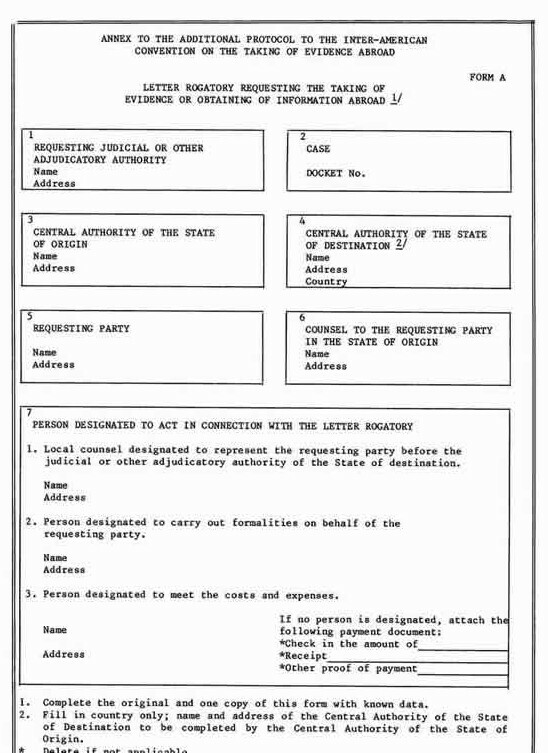 Upon receipt of a letter rogatory from the Central Authority of another State Party, the Central Authority of a State Party shall transmit the letter rogatory to the appropriate judicial or other adjudicatory authority for processing in accordance with applicable local law. The judicial or other adjudicatory authority or authorities that processed the letter rogatory shall certify the execution thereof in accordance with their local law, or the reasons for its non-execution, and shall transmit it with the relevant documents to their Central Authority. The Central Authority of the State Party of destination shall certify execution of the letter rogatory, or the reasons that prevented it from executing the letter rogatory, to the Central Authority of the State Party of origin on a form conforming to Form B of the Annex, which shall not require legalization. In addition, the Central Authority of the State of destination shall return the letter rogatory and attached documentation to the Central Authority of the State of origin for delivery to the judicial or other adjudicatory authority that issued it. 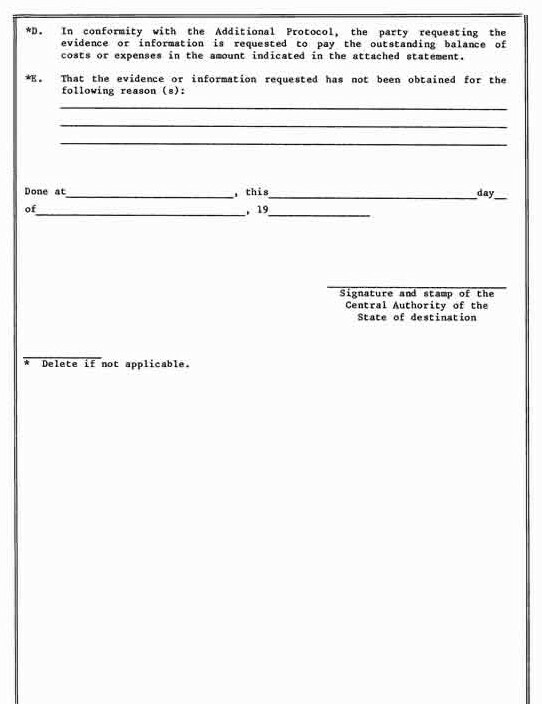 In processing letters rogatory pursuant to the Convention and this Protocol, the judicial or other adjudicatory authority of the State of destination shall apply the appropriate measures of compulsion provided for in its legislation when it finds that the requirements set forth in that legislation for the application of such measures in domestic proceedings have been met. The judicial or other adjudicatory authority of the State of origin may request notice of the date, time, and place of the execution of a letter rogatory transmitted to the competent authority of a State Party. The judicial or other adjudicatory authority of the State of destination that will execute the letter shall provide notice of the date, time, and place to the judicial or other adjudicatory authority of the State of origin, as requested. The legal representatives of the parties or their lawyers may attend the execution of the letter; their intervention shall be subject to the law of the State of destination. The processing of letters rogatory by the Central Authority of the State of destination and by its judicial or other adjudicatory authorities shall be free of charge. However, this State Party may seek payment by the party requesting the evidence or information for those services which, in accordance with its local law, are required to be paid for directly by that party. The party requesting the evidence or information shall, at its election, either select and indicate in the letter rogatory the person who is responsible in the State of destination for the cost of the above-mentioned services or attach to the letter rogatory a check for the fixed amount that is specified in Article 7 of this Protocol and will cover the cost of such services or a document proving that such amount has been transferred by some other means to the Central Authority of the State of destination. The fact that the cost of such services ultimately exceeds the fixed amount shall not delay or prevent the processing or execution of the letter rogatory by the Central Authority or the judicial or other adjudicatory authorities of the State of destination. Should the cost exceed that amount, the Central Authority of the State of destination may, when returning the executed letter rogatory, seek payment of the outstanding amount due from the party requesting execution of the letter rogatory. At the time of deposit of its instrument of ratification of or accession to this Protocol with the General Secretariat of the Organization of American States, each State Party shall attach a schedule of services, itemizing the pertinent costs and expenses that, in accordance with its local law, shall be paid for directly by the party requesting the evidence or information. In addition, each State Party shall specify in the above-mentioned schedule the single amount that it considers will reasonably cover the cost of such services, regardless of the number or nature thereof. This amount shall be paid when the person requesting the evidence or information has not designated a person responsible for the payment of such services in the State of destination, but has decided to pay for them directly in the manner provided for in Article 6 of this Protocol. The General Secretariat of the Organization of American States shall distribute the information received to the States Parties to this Protocol. A State Party may at any time notify the General Secretariat of the Organization of American States of changes in the above-mentioned schedules, which shall be communicated by the General Secretariat to the other States Parties to this Protocol. States Parties may declare in the schedules mentioned in Article 7 that, provided there is reciprocity, they will not, in certain matters, charge the party requesting the evidence or information for the services necessary for executing the letter rogatory, or that they will accept in complete satisfaction of the cost of such services the single amount that is specified in Article 7 or another fixed amount. The Convention shall not preclude a diplomatic or consular agent of a State Party, acting within his territorial jurisdiction, from taking evidence or obtaining information in the State Party in which he performs his functions, but in so doing he may not use measures of compulsion. However, whenever evidence is taken or information obtained from persons whose nationality is not that of the State accrediting the diplomatic or consular agent, the provisions of Article 10 shall apply. A declaration to this effect shall be made at the time of signature or ratification of, or accession to this Protocol. In the cases provided for in Article 9 of this Protocol, a diplomatic or consular agent may, through the appropriate channels, request the competent judicial or other adjudicatory authority to apply the appropriate measures of compulsion provided for under the laws of the State Party in which he performs his functions. The judicial or other adjudicatory authority shall apply those measures of compulsion when it finds that the requirements set forth in its legislation for the application of such measures in local proceedings have been met. 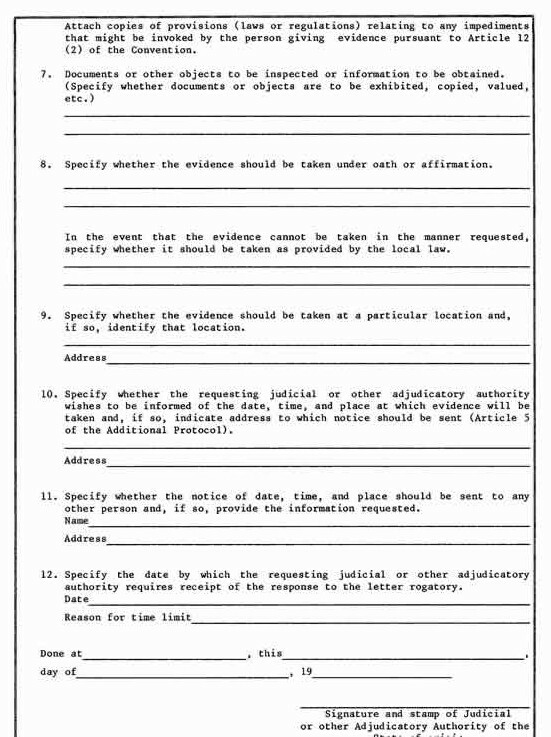 When evidence is taken or information obtained pursuant to Article 9 of this Protocol, the rules and procedures in force in the State of origin may be observed, provided they do not conflict with the provisions of Article 2 (1) of the Convention; however, the grounds for refusal to testify specified in Article 12 of the Convention shall also apply to the taking of evidence or obtaining of information. In the cases provided for in Article 9 of this Protocol, the persons from whom evidence is being taken or information obtained may be assisted by legal counsel and, where appropriate, by interpreters and by persons they trust. The failure of an attempt to take evidence or obtain information pursuant to Article 9 of this Protocol because of the refusal of the person called upon to provide it shall not preclude a request that evidence be taken or information obtained in accordance with Chapters I to IV of this Protocol. 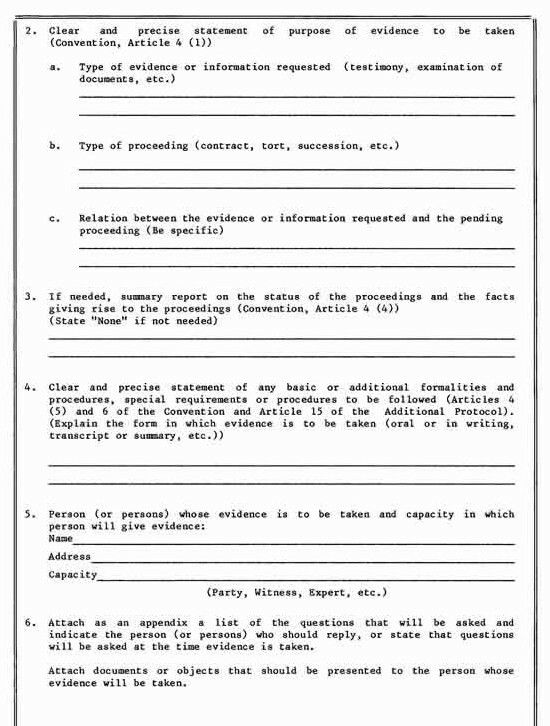 At the time of signing, ratifying or acceding to this Protocol, the States Parties may declare that the rules relating to the preparation and processing of letters rogatory for the taking of evidence or obtaining of information also apply to criminal and other matters provided for in Article 15 of the Convention. 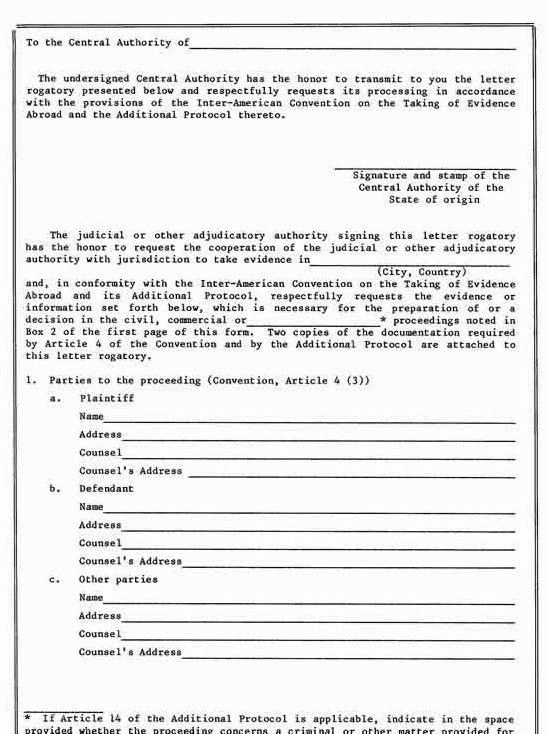 The judicial or other adjudicatory authority of the State of destination shall honor a request to follow special procedures pursuant to Article 6 of the Convention, unless they cannot be followed by it or they are incompatible with the fundamental principles of the legislation or the mandatory rules of the State of destination. The letter rogatory specifies those facts and circumstances causing the requesting party reasonably to believe that the requested documents are or were in the possession, control, or custody of, or are known to the person from whom the documents are requested. The person from whom documents are requested may, where appropriate, deny that he has possession, control, or custody of the requested documents, or may object to the exhibition and copying of the documents, in accordance with the rules of the Convention. At the time of signing, ratifying or acceding to this Protocol a State may declare that it will process the letters rogatory to which this article applies only if they identify the relationship between the evidence or information requested and the pending proceeding. The provisions of this Protocol shall be interpreted in such a way as to complement those of the Inter-American Convention on the Taking of Evidence Abroad. This Protocol shall be open for signature and ratification or accession by those Member States of the Organization of American States that have signed, ratified, or acceded to the Inter-American Convention on the Taking of Evidence Abroad signed in Panama on January 30, 1975. This Protocol shall remain open for accession by any other State that accedes or has acceded to the Inter-American Convention on the Taking of Evidence Abroad under the conditions set forth in this article. The instruments of ratification and accession shall be deposited with the General Secretariat of the Organization of American States. Each State may, at the time of signature, ratification or accession, make reservations to this Protocol, provided that each reservation concerns one or more specific provisions. This Protocol shall enter into force on the thirtieth day following the date on which two States Parties to the Convention have deposited their instruments of ratification of or accession to this Protocol. For each State ratifying or acceding to the Protocol after its entry into force, the Protocol shall enter into force on the thirtieth day following deposit by such State of its instrument of ratification or accession, provided that such State is a party to the Convention. If a State Party has two or more territorial units in which different systems of law apply in relation to the matters dealt with in this Protocol, it may, at the time of signature, ratification or accession, declare that this Protocol shall extend to all its territorial units or to only one or more of them. Such declaration may be modified by subsequent declarations that shall expressly indicate the territorial unit or units to which this Protocol applies. Such subsequent declarations shall be transmitted to the General Secretariat of the Organization of American States, and shall become effective thirty days after the date of their receipt. This Protocol shall remain in force indefinitely, but any of the States Parties may denounce it. The instrument of denunciation shall be deposited with the General Secretariat of the Organization of American States. After one year from the date of deposit of the instrument of denunciation, the Protocol shall no longer be in effect for the denouncing State, but shall remain in effect for the other States Parties. 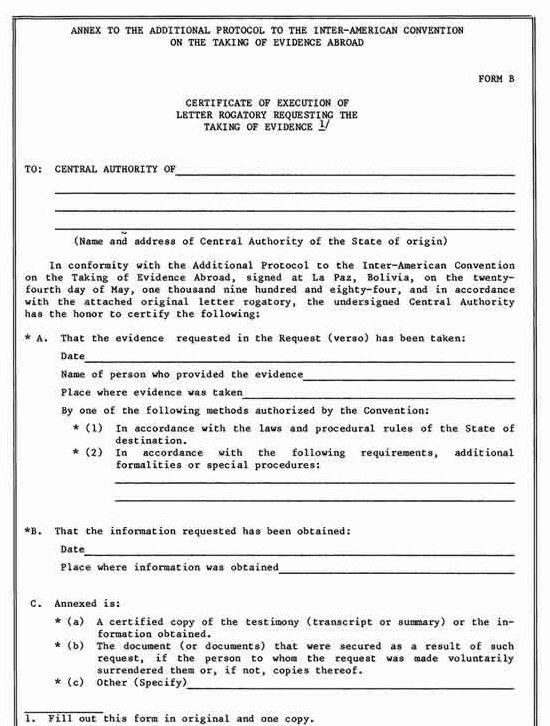 The original instrument of this Protocol and its Annex (Forms A and B), the English, French, Portuguese and Spanish texts of which are equally authentic, shall be deposited with the General Secretariat of the Organization of American States, which shall forward an authenticated copy of its text to the Secretariat of the United Nations for registration and publication in accordance with Article 102 of its Charter. The General Secretariat of the Organization of American States shall notify the Member States of that Organization and the States that have acceded to the Protocol of the signatures, deposits of instruments of ratification, accession and denunciation, as well as of reservations, if any. It shall also transmit to them the information mentioned in Article 1, the last paragraph of Article 2, Article 7, and declarations pursuant to Articles 8, 10, 14, 16, and 21 of this Protocol. IN WITNESS WHEREOF, the undersigned Plenipotentiaries, being duly authorized thereto by their respective Governments, have signed this Protocol. DONE AT LA PAZ, Republic of Bolivia, this twenty-fourth day of May, one thousand nine hundred and eighty-four.